Many people have encountered the situation where a friend or relative is having a baby and they want to buy a gift for the new addition, but they don’t know what to get. Two years ago we welcomed our son into the world and received quite a variety of gifts, services and food which has made us realize that what may seem like a great gift for a new baby or parent might be a life saver or it might be quite useless. As we await the arrival of our second child, I’ve been reflecting on what kind of items are good gifts for new parents and what might be bad gifts and have decided to share my thoughts here. Mr. Cheap was visiting last week and brought my wife a book as a gift – Guns, Germs & Steel which we are both interested in reading. Unless you have some specific directions as to what the new child requires then chances are they don’t need what you will buy them. Instead I would suggest buying something for Mom and Dad. Alcohol – ok, this is more for Dad if Mom is breastfeeding, but it’s always a great gift. Money – nothing is better than this. Food – trying to prepare food in the first week or two of a new baby (especially if it is the first) is really tough. The best gifts that we received were cooked food that was delivered to our doorstep. All we had to do was heat and eat. Services – this could include things like grocery shopping (the parents have to prepare a detailed list), mowing the lawn, cooking a meal, cleaning etc. Be careful with this one – if you have to ask a million questions while cleaning the kitchen then you aren’t doing any favours. Babysitting – if the newborn has any older brothers and sisters then volunteer to spend time with them. You don’t have to take them away to an amusement park – just playing with them and reading stories in their living room will be a huge help to the parents who will be occupied enough with the newborn and might not have the patience to read Curious George for the 20th time that day. Cleaning service – either hire them directly or give a gift certificate. This might not be appropriate for the couple of weeks. Diapers – giving new parents diapers is like giving them cash. I would avoid the newborn size and go with size one or two. 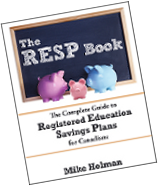 Educational savings – this won’t happen right away but consider helping out with an RESP (Canadian) or 529 plan (American). CPR/first aid course – these cost money and would be a great gift. This would be best given before the baby is born. Buy a gift for a sibling. I never thought of this before, but Mr. Cheap bought a book called “I’m going to be a big brother” for my son which was an awesome gift. If you want to buy something for any siblings of the newborn then buy something small or talk to the parents for suggestions. Baby Clothes – I would stay from baby clothes unless they are specifically requested or unless of course they have the labels of the parent’s favourite sports teams. The problem with clothes is that the cuter the outfit, the less it will probably get worn. Shoes are a complete and utter waste of money for a baby who can’t walk. If you think the parents are in a situation where they need clothes or other baby items, then talk to them first and maybe buy a gift certificate. Don’t expect the parent to know exactly what they need. Toys – complete waste of money. For the first two or three months, babies are more stimulated by looking at different patterns than any toy you might buy. Plus this is is one of the default gifts that everyone gets so they will undoubtedly have too many already. Other baby items – cribs, monitors etc. Talk to the parents before buying anything. Newborns don’t really need or want anything you can buy for them, so consider buying a gift or performing a service for a different family member who might appreciate it. Doing some errands, bringing some prepared food or babysitting for the family will be appreciated far more than any standard gift for the baby. Most important thing is to talk to the new parents before buying anything. How about a first RESP contribution to the kid? I like the idea of services. Anything that takes the pressure off is a godsend from what I’ve seen. Even as a wedding gift, I once bought a couple a gift certificate with a cleaning service so they could save a couple hours at a time when time was everything. Nicolas – RESP is a great idea. That might have to wait a bit since it takes time to set one up. Sam – cleaning service is an awesome idea…I think I will add it to the post. I can’t tell you how great it was that people thought of my 2 1/2 year old last year when we had our second baby. Having people bring her little gifts was so great. The ideas for the parents are really great too! Man, you people are brilliant – I’ve added the suggestions to the post. Is that your snapper in the photo, Mike? Cute. Guinness – yes, it is – @ 1 week old. I second food for the first couple of weeks post-partum and cash. The other thing every baby is guaranteed to need is diapers! Whether you give disposables or cloth (I’d check first to see which the parents are planning to use) you know this is a gift that will be used. Another gift I’ve given a few times is a little basket with basics such as wipes or washcloths, baby wash and shampoo, lotion, special baby nail clippers, soft hairbrush, etc. Squawk – shopping for baby clothes is very fun indeed!! Shevy – great idea – I’ll add those to the post. And of course, Mr Cheap is on the ball with the perfect presents, good work Mr C! It’s hard to get friends and family NOT to buy clothes so good luck!! I am in so much agreement with you that I can’t express it. No baby clothes. Argh. Cash and services, preferably please-just-watch-the-baby- for-a-while-so-I-can-vegetate services. Cooked food or even takeout delivered to us would be awesome. Of course, we will get fluffy lacey bits of clothes, but that’s what other people have fun buying. Nothing fun about buying and preparing a lasagna, is there? Baby clothes ARE fun but man, I look at my son’s closet and see so much stuff he grew out of after wearing it 3 times – drives me nuts! We’ve received hand-me-downs from friends that were expensive, fancy label (or whatever you call them) outfits that not only weren’t worn much, but in some cases they still had the sales tags on them. I suspect we probably won’t use them either. Obviously these were probably “shower” gifts but they are a good example of where someone spent $50 on a cute outfit that may never get worn. A complete waste in my opinion. omg..I just saw this. Congratulations!!!!!!!!!!!!! My hubby’s bestman from the wedding is also expecting this week. Now the hubby sorta wants one. You have some really good suggestions. When someone I know has a baby I always bring along a lasagne or other feed-an-army food to serve to well-wishers or throw in the freezer for later. If I buy clothes I always buy them in 9-12 mos. size or larger. People always do get plenty of clothes in the wee sizes, but the kids need clothes as they grow, too. For diapers I recommend buying size 2. My son was in size 1’s for about 2 days. I gave away lots of those cute, teeny tiny size 1’s! I ‘m not entirely sure I agree on the alcohol-as-post-baby-gift. I’m not a drinker, so it would go to waste here – and that’s probably most of the reason I’m not a huge fan. Even if people are drinkers, as you said if the Mom is breastfeeding she won’t be able to partake, and if she’s having any PPD it could make her feel like “there’s another thing I can’t have!” Perhaps a celebratory bottle of good champagne, but IMO there are better gifts. The services are terrific, especially the housecleaning. Anytime. Please. BeThisWay – thanks very much. 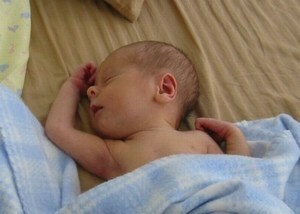 I avoid giving clothes and toys altogether for newborns (although I agree that they are fun to shop for! )… kids get so many of each, and often the gently-used (outgrown long before any wear can be detected) hand-me-downs from friends and relatives provide more than a little fashionista can possibly wear. If gifting a couple’s first child, I have been known to give the parents a digital thermometer… the kind that you put in the ear. Kids get sick at the most inconvenient times, and you can’t always dash off to a 24 hour Shoppers Drug Mart in the middle of the night. Portable playpens or zip-up clamshell carseat bags (think sleeping bags that stay in the carseat… you don’t have to bundle them up quite as much in the wintertime if you have these!) are also usually well appreciated. Another thing I try to do every January/February is to pick up a stack of the special issue “Year of the ” stamps from Canada Post. They are inexpensive, but make a nice addition to the baby card for babies born that year. This year’s Year of the Rat special issue is particularly beautiful. DRIPpy Chick – great handle! lol. Those are all great suggestions. 2. Putting money aside for when the kid inevitably needs to go to college and the parents can’t afford it. For example, one mother is a single 17-year old niece who needs driving lessons. Thanks to help from various levels of government, the best gift for this baby right now is a mother than can drive. Another set of parents live in a home that’s fading very fast. They’ll find a way to cover the monthly necessities, but simply can’t afford the “larger catastrophes”. So when they need money to fix the mold in bathroom or to simply to rent a moving truck for greener pastures we’ll cover the move as a gift for the baby. Of course, for the “well-off” parents, the above list is great, but I’d jump on with BeThisWay: The services are terrific, especially the housecleaning. Anytime. Please. Gates – you are doing some really good things for those people. I agree that some new parents need the basics, such as clothes etc. The key is communication to make sure that your gift will be useful. Great suggestions. Thanks for participating in this week’s Carnival of Family Life, hosted at On the Horizon tomorrow, April 14, 2008! Be sure to drop by and check out all of the other excellent entries this week! I’m giving the gift of photos. There is a local photographer that will go to the new mom’s house and take photos of her and the new baby. Prints are also included in this gift. Babies grow up so quickly – I think they will treasure this gift forever. CJB – that’s a really good idea!